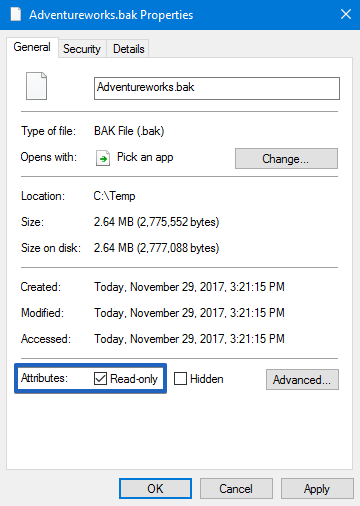 Cannot open backup device 'D:\Adventureworks.bak'. Operating system error 5(Access is denied.). That error might appear when you try to backup SQL Server database to a network drive. Therefore, this problem message usually occurs as a result of mistaken permissions to the network drive. Also, this issue can occur when there’s no directory with Log or there is not enough space on your drive. If you get that error using SQLBackupAndFTP try to specify a temporary folder for the backup job like C:\Temp and check if it fixes the issue. 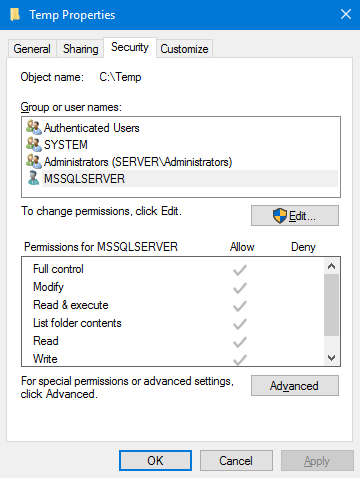 If it still throws the same error, or you get this issue using SQL Server Management Studio please check NTFS permissions for the folder you have specified and make sure if all users of your system have all permissions to it. To avoid the issues related to NTFS permissions we recommend you don’t use a folder in your profile folder like C:\Users\…. Another but the more rare reason for which this issue may arise is that a backup file with the same name already exists in the folder and it’s Read-Only. To fix it just right-click on it then choose “Properties”, uncheck Read-Only and press “Apply” to save all new settings. If “Read-Only” is unchecked but you still have this issue go to the “Security” and give all necessary permission to the user. After all necessary configurations are done you will be able to perform SQL Server database backup successfully. This solved my problem on a windows 10 local installation. I fixed my problem on a Windows 2008 R2 backing up directly from the Sharepoint 2010 Foundations Central Administration, by allowing full access to Authenticated Users on the shared permissions of the backup folder. This Solved my problem on Windows Server 2012 Essentials. Great!!!! Thanks for this blog. 3. 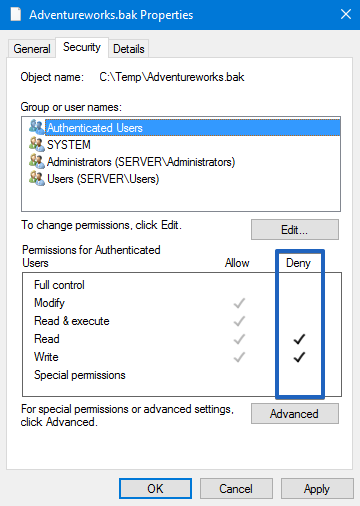 Add this user to have full control of permissions on the directory of back up by navigating to the folder / properties/ under secirity tab / Edit and give the same username and click on Check and Ad by giving full control. Now running the query of backup created the file. Thanks mate, your method worked for me, thanks a ton !!!!!! Kartheek thanks for the post! That solved my problem like a magic wand breaking a spell! i had the same issue when taking a backup on a shared location outside the server. I added permission of network and network service on that folder and it worked for me incase anyone else had the same issue. Shoab, that worked for me too. Actually several times on several systems. It must be something in the installation of the SQL of the program we use that requires it. And it is actually just the permissions of network services that fixes it for us. Great!!! 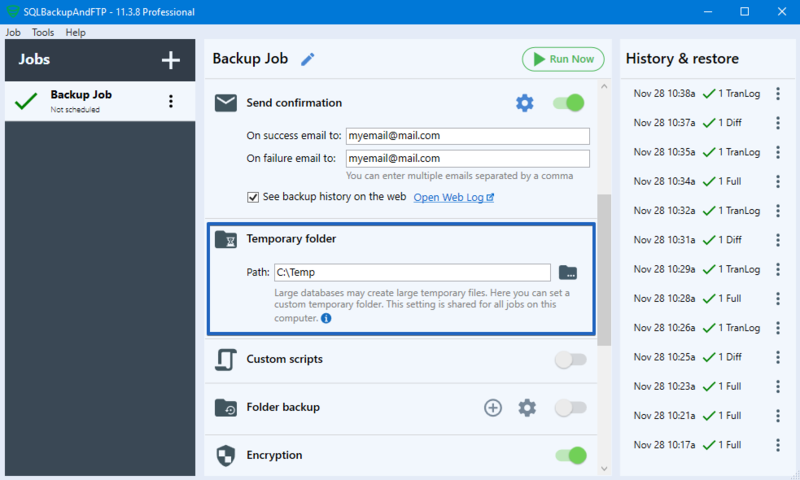 Worked for me allowing full access to Authenticated Users on the shared permissions of the backup folder. Very helpful thanks for that.